Dental erosion is the loss of tooth structure due to exposure to acids. Enamel, which is the hardest material in the body, is the protective cover on teeth that protects the dentine (which is the inside part of the tooth), and the pulp which is made up of nerves and blood vessels. Erosion can dissolve the enamel and expose the dentine. Once exposed, dentine will wear faster than enamel. 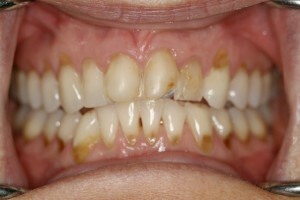 Erosion can cause the teeth to become sensitive, yellow in colour, and can lead to decay. Dental erosion is a silent epidemic. Acids that cause erosion are most commonly found in drinks such as fruit juices, sports, energy and soft drinks, herbal teas and alcohol. These acids can gradually dissolve the enamel from teeth and lead to the loss of the tooth’s natural shape, or the premature exposure of the dentine. Most people are aware that soft drinks and fruit juices are contributors to tooth decay because of the significant amount of sugar that they can contain – a 600ml bottle of soft drink can contain up to 13 teaspoons of sugar. What is not so well known is that soft drinks, along with fruit juices, sports drinks, some alcoholic drinks, herbal teas and so called ‘energy drinks’ can also often have high acid levels, which play a major role in the development of tooth erosion. Avoid holding or ‘swishing’ them around your mouth as this increases the likelihood of dental decay and enamel erosion. Use a straw when drinking soft drink and juices as much as possible to minimise the acid exposure to teeth. If you do drink juices, soft, sports or energy drinks, try to consume them chilled, as cooler temperatures have been shown to be less likely to cause tooth erosion. Drink fluoridated tap water as much as possible. After consuming acidic beverages, don’t brush your teeth right away – brushing can remove the softened tooth layer (resulting from the acidic exposure), increasing the amount of tooth loss. Wait one hour before brushing teeth. Some medications can cause reflux. This is a common cause of tooth erosion. Medications can also cause a dry mouth. Saliva plays a vital role in protecting your teeth by washing away particles of food and neutralising the damaging acids. If you have a dry mouth, erosion may damage your teeth more quickly. If your medication is causing dry mouth or acid reflux, ask your doctor if there are any alternative medications you can try. Work with both your doctor and dentist to find the right medication for you, and your teeth. It is also important to note that caffeinated beverages and alcohol, especially wines, are also dehydrating and can lead to dry mouth and therefore tooth erosion. Erosion can also be a side-effect of both Type 1 and Type 2 Diabetes. Diabetes is characterised by extreme thirst. If acidic beverages are consumed to quench the thirst, then erosion can become a very serious problem. People with diabetes also often suffer from reduced saliva flow as a result of some medications, which may also contribute to erosion. Tooth erosion can be very costly to repair. Restorative treatment can vary from simple procedures such as resin bonding to more complex treatments such as multiple crowns. Drink plenty of water. Fluoridated tap water is best. Restrict acidic beverages to main meals. The effect of acidic drinks is reduced when consumed with food. Limit your daily intake of fruit juice, soft, sports and energy drinks, herbal teas and alcohol. Use a soft toothbrush and brush your teeth twice a day with fluoridated toothpaste. Visit your dentist for regular check-ups. The amount of money it will cost for regular dental check-ups is minimal compared to what the cost may be if your teeth go unchecked for a long period of time. Keep your teeth healthy with regular brushing, flossing and rinsing. View more information about treating tooth erosion at gum disease, tooth decay and restorative dentistry.